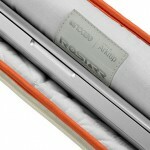 incase has rolled out yet another collaboration for its MacBook Pro sleeve and iPad 2 case. this time, it works with Parisian fashion A.P.C. 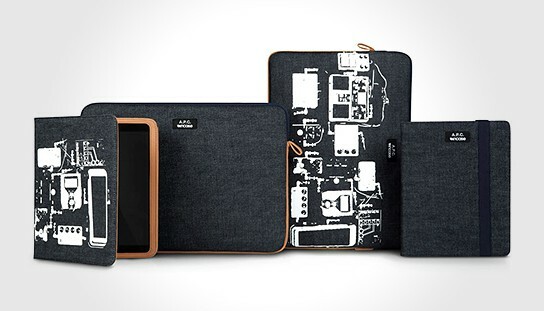 to offer Apple users sleeve for their 15-inch MacBook Pro and Book Jacket for iPad 2. the collection uses the finest selvage denim from Japan, coupled with leather trim, thus offering an added fashion sense to your everyday gadget accessories. 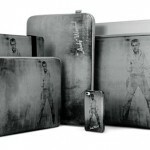 two versions are available: the plain denim models and the A.P.C. Asia Exclusive with white screen printing. the latter are only available at A.P.C. store in Tokyo, Osaka, and Hong Kong – of which, none is anywhere near me. rather unfortunate, but at least the rest of the world still gets the plain denim version – which brings us to the next not-so-good news: the 15-inch MacBook Pro has already sold out at the time of this posting. prices start from $124.95 for the Protective Sleeve for 15-inch MacBook Pro, while the Book Jacket for iPad 2 will set you back at $224.95. a few more look after the break.